The temple is open seven days a week from 7:30 a.m. to 12:30 p.m., and from 5:00 p.m. to 8:00 p.m. Aarti is held at 8:00 a.m., 12:00 noon, and 7:00 p.m. daily. There is also Aarti Ceremony at noon on Sundays. The Sunday School hours are 8:00 a.m. to 1:00 p.m.
Outside of the designated hours, visitors can visit the temple, provided the religious leader, Swami Gi, is available to let them in. Devotees should call before visiting the temple outside of the regular temple hours to make arrangements to be let inside the temple. Sharmaji conducts daily worship of the deities, performs aarti to the deities at designated hours of each day, conducts worship during religious and other special occasions, performs Sathyanarayana Pooja on full moon days of each month, and is available during havans. Sharmaji provides priest services for special occasions at devotees’ homes with prior arrangement. Providing transportation for Sharmaji to and from the temple is the requesting devotee’s responsibility. Prior arrangements can be made for priest services by calling the temple. Also, visitors can request special worship at the temple to suit their special occasions and needs. 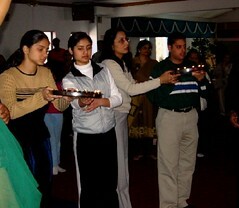 Designated times for Aarti during regular days are 8:00 a.m., 12:00 noon, and 7:00 p.m. 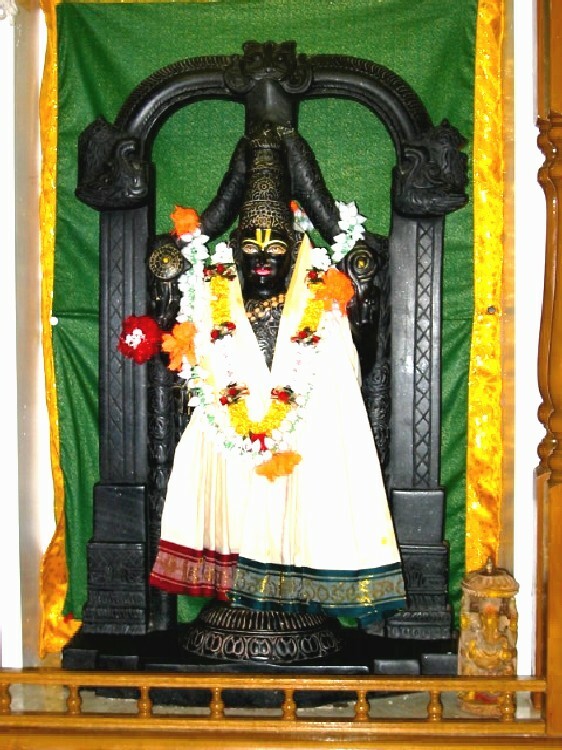 However, during special events, religious celebrations and other unique occasions such as havans, cultural programs, Sathyanarayana Pooja and Katha days, aarti times may be adjusted to suit the occasion. 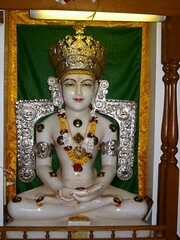 Universal Healing Program: Every Thursday at 7:30 p.m.
Bhajans: Every Friday 7:00 p.m. to 8:00 p.m. Stress Free Life: Weekly Sunday Integral Yoga Class from 8 a.m. to 9 a.m. at the temple. See the HARI Temple website for a yearly calendar. The HARI Temple is a site not only worship, but also for a number of events designed for education, spirituality and Indian community interaction. On a typical Sunday, families and individuals arrive beginning around 10:30 for a variety of different responsibilities, such as food preparation, teaching and taking classes, room set up, etc. The main service begins usually around noon, when everyone gathers upstairs for general announcements. The children of different classes announce what they have learned in their lessons that day, the aarti is performed, and the service closes with everyone gathering downstairs to enjoy the food prepared by the family assigned for that week’s lunch. Also available weekly are programs designed to promote health and spirituality, such as the “Universal Healing Program” and Bhajans. Special events are planned around ceremonial days, some of which include Gudi Padva, Ramanavami and Hanuman Jayanti; each festival having a different celebration. There are a number of classes available for children of all ages. The school currently offers classes at different age-appropriate levels in Hindu religion; language classes in Gujarati, Hindi and Tamil; instruction in classical Indian dance and vocals; folk dance; a Youth Forum; and for high school students, SAT preparation classes for Math and Verbal tests. Publications include The HARI Times, a monthly publication, available online. There is a first-time registration fee of $25 dollars followed by a renewal fee of $10 per year, which covers all classes offered at the HARI Temple except for the Indian dance classes. Indian dance classes run $6-11 per student per class. The Hindu community in the Harrisburg area dates to the 1950’s. The community grew slowly through the 1960’s, and in 1972, twenty-five new families moved to the area from Bethlehem, Pennsylvania. In 1974 there were about 30 Hindu families in the greater Harrisburg area. These families usually congregated at various area churches that sometimes charged a nominal fee. Several individuals at the time suggested the idea to build a temple, and they began looking for a site to build a new temple. Though their preference was not to use an existing building, the community did purchase an old building in West Fairview Township and modeled it inside to look like a Hindu temple. This was the “first” temple of this community and it opened in April of 1975. 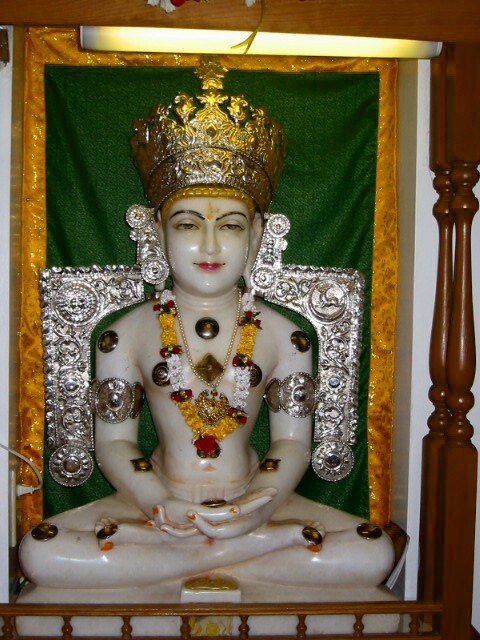 They chose Lord Rama as the primary deity (as it is to this day) because many of the Indian families of the 1970’s felt a particular connection to Lord Rama. 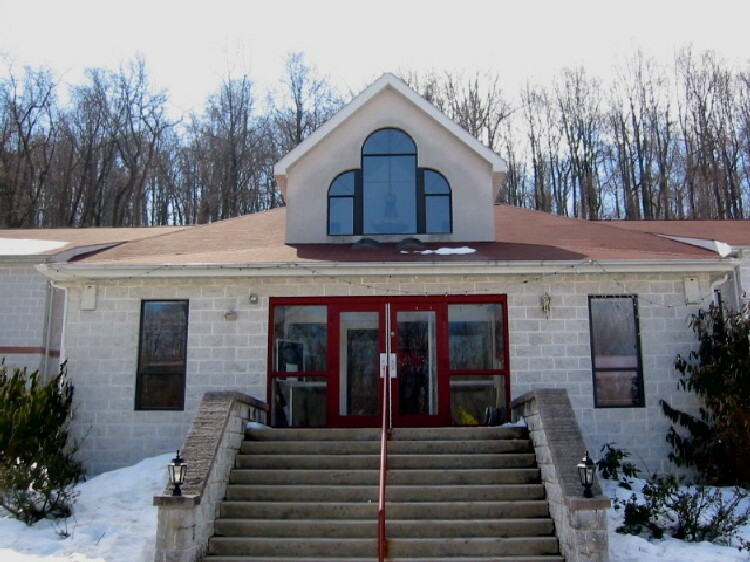 After the building of this temple in 1975, the community decided to begin fund raising to construct an original building on a plot of land that was near the highway and also readily accessible to the Hindu populations in York and Lancaster. Originally, the community had found a beautiful plot of land in Camp Hill. However, when there was a zoning board meeting held to discuss the building of the temple, many local residents in the area confused the HARI Temple with the Hari-Krishna movement and were very apprehensive about the building of any Indian temple in the area. Faced with this opposition, the HARI community decided to give up that plot of land in search for something else. In 1980 the community located 6.5 acres of land in New Cumberland. They wanted to avoid the same frustrations of the Camp Hill attempt, so a few members of the HARI community went around the surrounding neighborhood and explained their purpose, their religion, and that the HARI community was also not related at all with the Hari-Krishna movement. This tactic proved quite successful. When this township held a zoning board meeting to discuss the building of the temple, not a single person showed up to oppose the idea. Soon after, the community began collecting money, which was a difficult challenge in the beginning because the community was very apprehensive to pay for a dream without a tangible form. Eventually, as the temple became a visible object, the money issue ceased to exist. In fact, when the temple was finally built the original cost of the project had more than doubled. These costs were supported through the enthusiastic donations of the Hindu community; no loans were used. 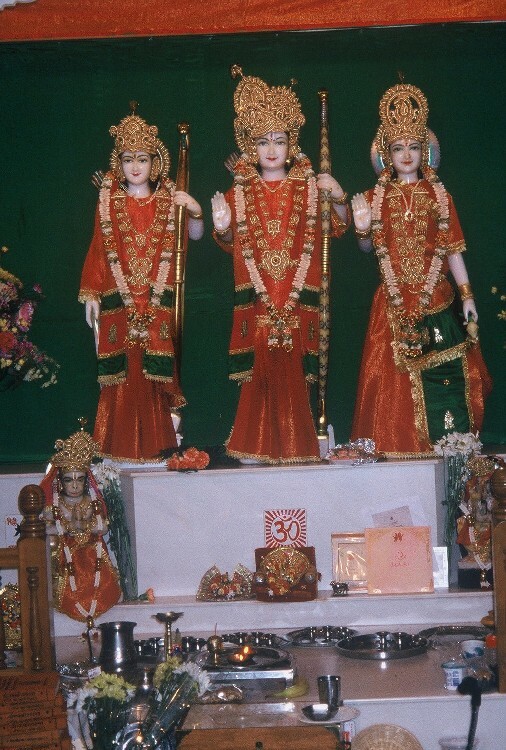 The HARI Temple was finally opened on July 4, 1986, with Hindus in attendance from York, Harrisburg, Lancaster, Pittsburgh, Allentown, Baltimore, and Washington, D.C. The area of the temple is now approximately 11,000 square feet: 5, 000 square feet In the original 1986 structure, with two 3,000 square foot extensions added on either side from November, 1996 to June, 1999. For more information, visit the Institute for Cultural Partnerships’ online resources about Hindu and Indian communities of central Pennsylvania. Ethnicity: People who attend temple are predominantly of Indian descent. Both north and south India are represented, as are various regions throughout India, creating a diverse Indian membership. Most of the people are citizens while some may still have H1 visas. A lot of the HARI Temple’s activities focus on children and youth; on any given Sunday there are more children and teenagers than adults. In addition to the Indian members, there is also a small number of Americans of European descent who regularly attend. Languages: Due to the diverse population of the temple, people speak a variety of Indian languages, however Hindi and English are spoken the majority of the time. The children have an opportunity to learn several Indian languages during Sunday school. The languages taught are Hindi, Tamil, and Gujarati . Speeches are made in English. The services are conducted in Sanskrit and Hindi. Age Composition: The age composition has a wide range. There are elderly, middle aged, young parents, toddlers, and elementary-aged and high school-aged children. There are, however, few people in their twenties or college age, as most of the high school graduates leave the area for college and do not necessarily quickly return. Membership: There are about 670 members, which consist of families who pay $51 per year or $600 for a lifetime membership. The membership fee covers administrative expenses along with participation in classes and group trips. Membership consists of the husband and wife and any of their dependents. There are approximately 700 to 800 people who will show up at major festivals. Only members can elect the trustees and committee members. Governing bodies: There is a Temple committee, which is elected yearly by the members. This committee is made up of a president, treasurer, secretary, and six other vice presidents. A Board of Trustees, which consist of nine members, is elected every three years. Three members are elected each year and three retire each year. The Board of Trustees make long-term decisions for the temple. Leadership: The religious leader is currently Mr. Shambhoo Dayal Sharma (Sharmaji). The lay leader is Naran Patel. The school director is Dr. Mukul Parikh. 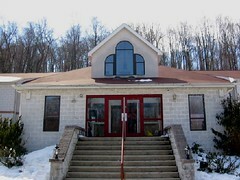 The Hindu American Religious Institution is located at 301 Steigerwalt Hollow Road, New Cumberland, PA. It sits on a 6.5-acre plot of land in a slightly wooded area in Fairview Township. One enters the parking area through a decorated archway. The temple itself is elevated above the parking lot. From the parking lot, a path follows to the staircase leading directly to the entrance of the building. The face of the building is built of white stone, sectioned into three distinct parts. The body of the building is centered with the staircase as well as the most prominent of three triangular architectural forms. There are two sections branching off of the main one; all three have red roofs. There is a very simple interplay between the white stone and red trimming evident on the glass entrance as well as the roofing. Once inside the building, the foyer is tiled with white marble. To the left is a small closet area reserved for coats and shoes, to be removed before entering the main hall of worship. After ascending a few stairs, one enters the main hall. Against the far wall is the main shrine for worship. Here the three large, standing deities of Lord Rama, Lakshmana, and Sitadevi (known best for their actions in the Ramayana, a Hindu epic that largely emphasizes following the good dharma law) have been placed on a semi-raised plane above the ground. Before them are a number of other gods smaller in size, as well as candles and incense lit for prayer and a bell attached to the ceiling to the right of the altar. On either side of the main altar are three smaller showcases of other gods. To the left is the Goddess Saraswati (a form of the goddess who is well known for blessing students), followed by Lord Shiva/Parvati (the deity associated with contrasts paired with his consort), and Lord Mahaveer (a Jain deity that reflects the HARI Temple’s openness and accessibility to Indians in the area who are Jains). 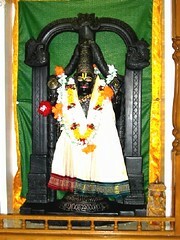 On the right side of the main altar are Lord Radha/Krishna (Radha is the gopi [cow herder] wife of Krishna, a more mischievous and playful form of Vishnu), Goddess Durgamata (a ten-armed deity who is known for slaying Mahisasura, the buffalo demon that was threatening to destroy the world and the gods themselves), and Lord Venkateswara Swami (this form of Vishnu is represented in black marble; the use of the black marble from Jaipur reflects the varied regional origins of HARI Temple members). Located behind the main altar is a sectioned off walkway housing miniature tiles and figurines also for worship. There is also a small (3’ x 3’) “fire altar” located in the right wing of the temple worship area. The altar is a simple layout of rows of tiles on the floor of the temple with a metal chute (complete with exhaust fan) extending 2 1/2-3 feet from the temple ceiling. 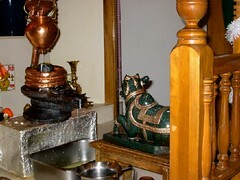 This small altar is utilized for havan (worshipping of the fire that may be connected with the earliest Vedic practices of worship contingent upon the use of fire). During a havan a small glass pot (usually containing herbs) is hung just below the chute; the fire created by the lit herbs is quite small and contained and the tiles below the chute serve as an easily cleanable surface that catches any ash or soot created by the fire. The room itself is rectangular in shape, carpeted and lit. The walls are fairly bare with a few tapestries/religious decorative pieces on some walls. The room can accommodate up to 450 worshipers at a time, with the space being versatile enough to accommodate a number of different ceremonies. The lower level of the building is approximately the same size as the upper level, with a multi-purpose space dedicated to classrooms, a kitchen, and restrooms. To the left, upon entering, is the kitchen, used weekly by the women who prepare food for the community meal following services. Off the main room are other smaller rooms, some used as offices and some as classrooms. The main room is usually used as dining hall following services, in which tables and chairs are set up to accommodate the diners.